Since 2015, dramatically changing the system of delivery, receipt of patents. In this regard, foreign citizens, and also for local employers there is a lot of issues related to patents. In this article we will answer the questions of foreign nationals, in one of the following articles, we will present the answers to the most popular questions from Russian employers. - a foreign citizen who arrived to Russia in order not requiring a visa. Step 1. First of all, you must personally or through the authorized organization to contact the Department on labour migration issues with the documents. Step 2. The deadline for application is 30 days from the date of entry into Russia. If a foreign citizen violates the deadline, it is assigned a fine in the amount from 10 000 to 15 000 rubles. Step 3. The patent is exclusively made in person, within 10 working days from the date of filing. Step 4. Within 2 months after receiving the patent, the foreign national must submit to the Department of labor migration of a copy of the contract under which he is working (if working for an individual entrepreneur or a legal entity). Step 5. 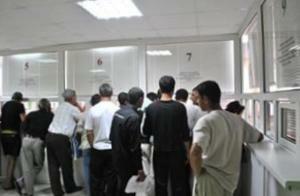 When applying for a patent, the migrant will be required to undergo fingerprinting examination. - photo 3x4 (2 PCs). To work the foreign national is only in the area specified in the patent. The patent also indicates the specific position and the type of economic activity of the employer company. This should apply to the territorial body of the FMS of the region in which the foreign citizen intends to work, within a period not later than 10 working days prior to the expiration of temporary stay. The term of a patent is from 1 to 12 months depending on payment of tax, not more than 12 months. If a foreign national employed by a legal entity or natural person, he must within two months from the date of receipt of the patent to submit to the Department on labour migration, the copy of the employment contract or a copy of a civil law contract on performance of works or rendering of services. To confirm (extend) of a patent, a foreign citizen need to pay tax on the income of individuals regularly and on time. A foreign citizen will be able to pay tax upfront for any period from 1 month to 12 months at a time. If a foreign citizen will not pay tax, its patent invalidated, and he will have to leave Russia. To obtain the second patent, it is necessary not later than 10 working days before the expiration date of the patent to submit the necessary documents to the FMS of Russia. The number of applications for reissue of a patent may not exceed 1 times. In the patent profession and is the profession by which a foreign citizen operates. A foreign national not entitled to work in the profession (positions, specialties) is not specified in the patent. If during the term of a patent a foreign citizen has changed the name, surname, patronymic name or passport details, then within 7 days you must contact the territorial FMS for making changes. - there are grounds envisaged by the PP. 1 – 10, 15 claim 9, clause 9.1, 9.2 and PP. 1 paragraph 9.7, item 9.8 of article 18 of Federal law No. 115-FZ dated 25.07.2002. - the documents confirming the payment of tax on the income (receipt from Bank). Re-submit the documents after a year from the date of refusal to issue, reissue, or the revocation of a patent. From 01.01.2015 the tax on the patent for work at physical persons is 2 744,5 rubles. Patents and work permits, furnished by foreign citizens in 2014, which expire before 1 January 2015 extended (which in 2014 paid the tax to incomes of physical persons in the form of fixed advance payment) continue to have effect during the period for which they were extended (during the period for which tax was paid) or until terminated, without any possibility of a further extension after 1 January 2015. Patents issued prior to 01.01.2015 year, allow foreign citizens to work ONLY for individuals. Foreign nationals who received a patent to 01.01.2015 and does not leave the territory of the Russian Federation, have the right to issue a new patent without observance of the 30-day period from the date of entry in Russia, BUT! submit your documents NO LATER than 10 working days prior to the expiration of the period of temporary stay.